I would argue that the TC-Helicons pedal style vocal effects are some of the best ideas to come out of their facility in Vancouver, BC. They are small form factor, intuitive to control and easy to get a great sound out of. No menu's to navigate, just simple rotary knobs, buttons and a master on/off footswitch. They are in my opinion a joy to use. The TC Helicon Harmony Singer is no different. Rotary controls for harmony type, wetness and reverb line the top along with a Tone button borrowed from the Mic Mechanic and a master switch flesh out the top. On the sides are the typical mic control switch along with instrument in and through as well as a thoughtful ground lift. On the back you'll usually find mic in/through as well as power and USB ports for firmware updates. What makes the magic happen, though, is the instrument in port. TC Helicon calls the Harmony Singer "Guitar Controlled". 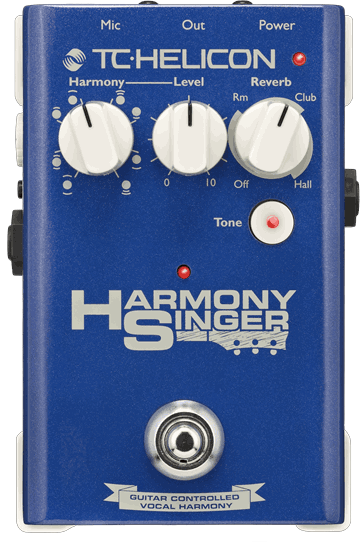 I imagine you could plug any kind of instrument generating tone and a line level signal but if you opt to use the TC Helicon Harmony Singer without anything you'd be selling yourself short. Why? Because the real beauty behind this TCH box is that it uses instrument pitch to perfectly dictate the harmonies produced. Aptly put your harmonies will always be in the correct key. Always. And that is what makes the Harmony Singer awesome. In practice, it took me little time to dial in something that sounded pretty convincing. The Harmony Singer gives you a pretty reasonable selection of harmonies from a 6th below all the way to a 5th above as well as mixes of the two so provided you don't have a lead vocal that's completely bonkers chances are you'll be able to find something that will fit. The key here to maintain realism is to use harmonies sparingly and to find the right place for them to sit in the mix in relation to the lead vocals using the Level knob. It would also help if you do have some basic understanding of chord structure to determine the optimal sounding harmony for the particular application. All in after spending a few weeks with the TC Helicon Harmony singer I can honestly say this is the first harmony effects box I've used that is both easy to use and produces realistic harmonies. It's not the real thing and I wouldn't use it in place of human produced harmonies in the studio but in a live situation its one more useful tool to add to your vocal toolbox.